We're in the middle of testing. 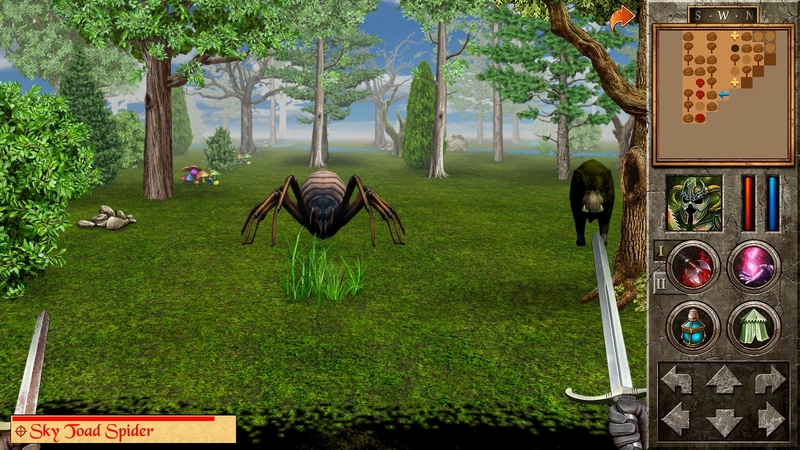 Wild boars and peaceful swans and of course spiders! You know what more quests means, don't you? More work for you answering my endless requests for help in the forum! Not all at once. We're making good progress testing Celtic Queen so there's a slight chance it might be done by the end of March. Dr. Vlad is still working on new material for HOLIII, so I can't say when that will start testing. Meanwhile Liz and I are working on Caerworn Castle, which takes place in Wales and will probably be at a level between Celtic Queen and HOLIV. Level all depends on whether HOLIII gets done first. Working hard. I have to test it myself, so when I'm finished, I will let you know. : ) Celtic Queen is a big file. I have a few more quests to finish--small ones. 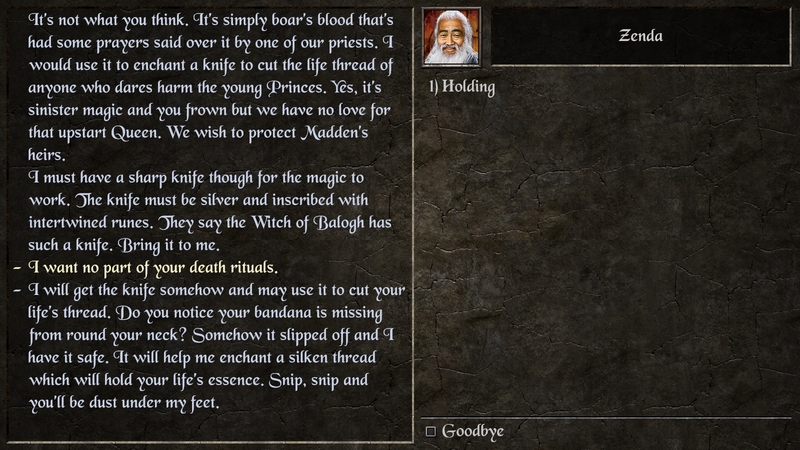 I'm enjoying playing the game and will put up a quest list as soon as I've finished the last quest. But Redshift is ultra busy right now. It will be at least two weeks before it will be ready--Sylon has to draw the icon and the graphic for Android. Thanks for your patience. It sounds like everyone’s busy working on the Quest!..patiently waiting for Celtic Queen, I love the Celtic series! I’m glad there are a lot of quests in this expansion, I love lots of quests! Cat i'm conviced that this is going to be better than the expansions before. My cats don't like coffee they love milk ;-). Is there actually a reason why there are no more NPC chars like in the main game or fire and ice (i travelled back to Main game yesterday)? What do you mean? NPC characters like in the main game. There are npc characters all over the place. If you mean walking npc's. The expansions are dangerous places and walking outside is usually not what they do. You have enemies at every gate to the towns. You'd have to be pretty confident to be walking around without a weapon if you're an npc. All I can say about Celtic Queen is that I've really enjoyed playing it. But my memory is short and I'm sure I enjoyed the others too. Yes i was thinking about the walking npc and about the "working girls" AT every corner in the city. There were some quests especially in the main game where you had to get some informations from the npc for example. For example the quest were you had to proove that you ar not a murderer. The expansions were all together great. This is fact. With or without walking npc i've enjoyed all of them. I was just asking if there is a special reason why there aren't any. The Quest got a lot of negative comments for the "Working girls" from women who felt offended, so I try to keep them down. They're not that "working" although they might want to give you a hug. I don't find the walking npc's that useful for a number of reasons. Logically in the Hero of Lukomorye world, where you're at war, it's too dangerous to be out. And in general in the other expansions. Keep in mind, I worked on the base game and the Official Expansion, but I was a newbie then. I've evolved. The streets in most of the villages are kind of narrow and a walking npc would probably block you. You can get as much info from an npc on a door as on a walking one. : ) Also, some of the expansions take place in outer space or in times a bit more ancient than medieval, or in exotic places, so those costumes of the walking npc's would really be out of place. Waiting on Sylon's drawing the pic for Android. Will ask Elendil how close we are. Thanks. As I mentioned in another post: Elendil will try to work on uploading Celtic Queen to the Apple Store and the Google Play Store this weekend. I can't promise he'll have the time but he's going to try. Then it has to be approved in both places. I upload to Steam at the same time. So please be patient. I don't want to pressure him because he has a lot to do. He has the file, just needs the time. Testing Hero of Lukomorye III atm btw. You can now make Permanent Gush in HOLIII. Great, thanks! Is not easy to be patient now..
Wonderfull news! Any appx. date of releasing HOL III, when you are already testing? It will take us about three or so more weeks to finish testing but we work with Redshift's schedule and sometimes they are very busy. They do the best they can to work with us so we work with them. We'll get there. Also, got to give people a chance to finish playing the last expansion. : ) Hero of Lukomorye III is level 50. Want to make sure enough players have time to get there. Elendil has uploaded the mobile versions and as soon as they're all approved, I'll hit the button on Steam.